/zone/zoning_handbook/c5.pdf. New York City Department of City Planning. In 1961, New York City passed a new zoning law that dramatically reduced the height and bulk previously allowed under the 1916 zoning formula. Instead, it set a maximum amount of space that a property owner could build within the footprint of his lot. This formula, known as the Floor Area Ratio (FAR), is the square-foot area of the lot, multiplied by a number for that zone, such as 6, 10, or 15, that equals the maximum number of square feet of floor area that can be arranged and stacked within the footprint of the lot. The FAR formula is applicable to all types of structures and applied to all districts-Residential, Commercial, and Manufacturing. 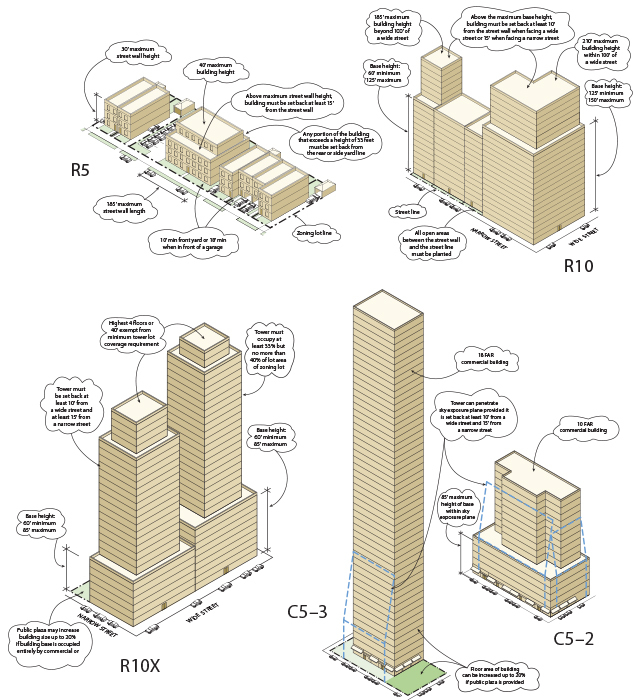 The diagrams shown here, compiled from the current zoning primer, available on line on the website of the NYC Department of City Planning, illustrate several formulas for residential zones. While the developer is allowed to arrange the FAR on the site however he prefers, the new law also offered incentives to create open space around buildings by allowing bonus FAR for new construction that created plazas or other public access at street level. This bonus encouraged the modernist expression of a sheer, slab-like tower rising in an open plaza for both office and residential towers. As Robert A.M. Stern observed in New York 1960: "The passage of the new zoning was postwar New York's pivotal architectural event, irrevocably changing the relationship between buildings and streets that had prevailed for over three hundred years." Another important provision of the 1961 law was the ability to sell and transfer of unused FAR, or "air rights," to an adjacent property.